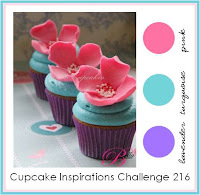 It's time for this week's Cupcake Inspirations Challenge and today we are celebrating with some soft color inspiration. This week we are sponsored by Robyn's Fetish. Be sure to check out her store. She has some wonderful images just waiting for you to colorize! I printed my image onto a 4x5.25 piece of white card stock and then colored her in using Copic markers. I purposely left enough room for the two strips of Washi tape at the bottom to tie in our color scheme. 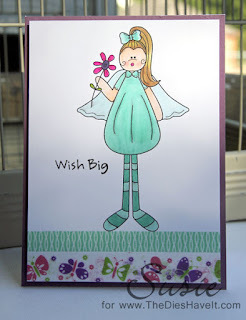 Then I just matted my image on some purple card stock and then onto my card base. Quick and easy! Add your project based on our inspiration photo showing these YUMMY looking cupcakes.